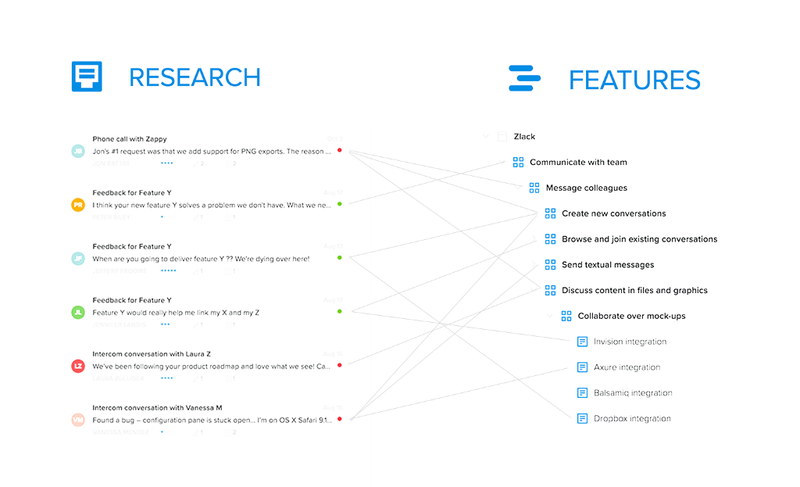 These views are possible in productboard thanks to the links you and your team can establish between insights you uncover on the Research board and feature ideas you’ve logged on the Features board. Try doing that in Excel! Organize your feature ideas by user need. This may come as a surprise if you were inclined to group features by where they belong in the product, or the initiative they belong to. After all, productboard offers considerable leeway in how you organize feature ideas with components. Ultimately components are just folders and they can represent anything you’d like, but we recommend using components to represent the core users needs that underlying feature ideas address. The first five components represent user needs. The last two represent needs of the business if it’s to stay afloat. And those can be broken down into additional sub-needs, and finally, feature ideas. 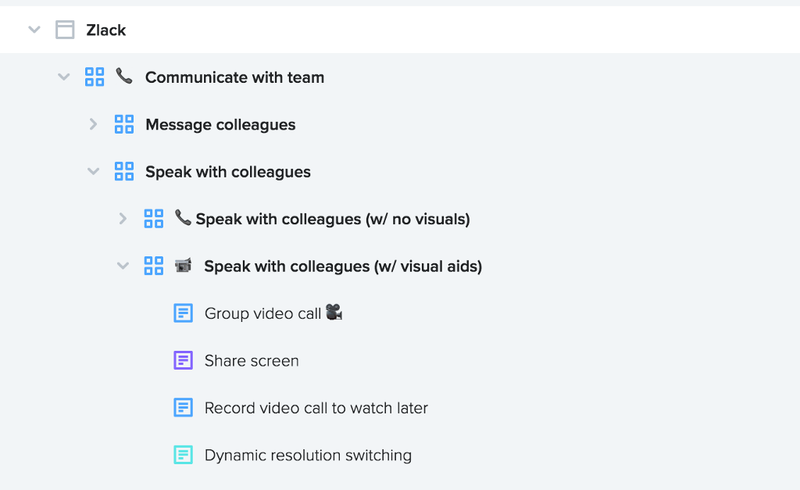 Above we see several features logged beneath the user need Speak with colleagues with visual aids, which could include features like video calling or screensharing to help communicate more complex topics. There are several advantages to organizing your Features board in this way. 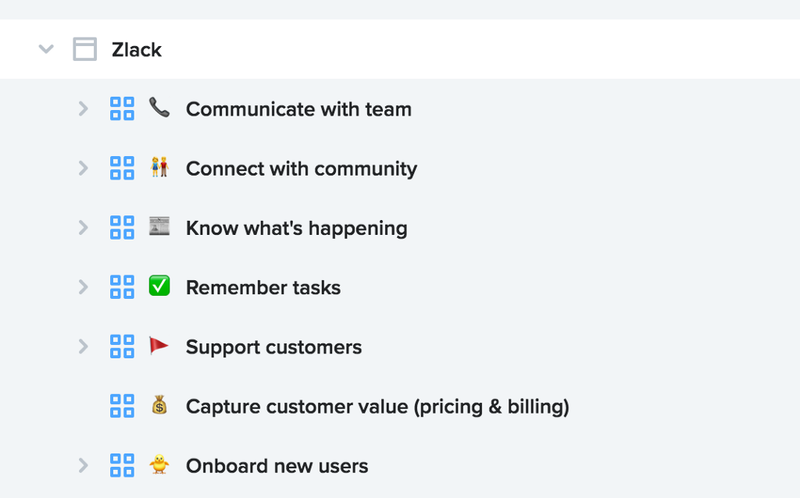 Organizing your Features board by user needs means that when you find new insights in user research and feedback, you can link them straight to the needs they represent (each signified by a new or existing component), even if you don’t have any solution ideas for it yet. 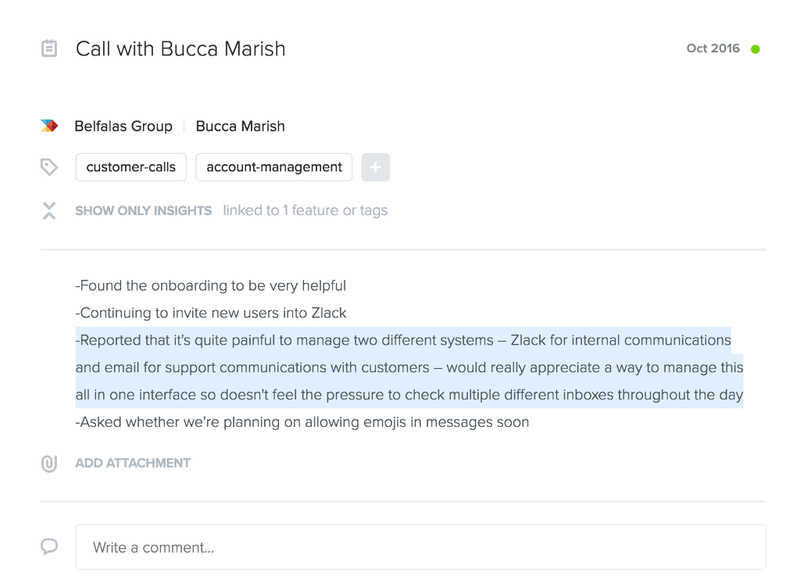 That means when a customer describes the pain of managing Zlack chat for internal communications in addition to using email for customer support, we can begin tracking this need right away. When we first come across a new user insight like this, it’s not always clear if other users share the need or how we might address it with a feature. 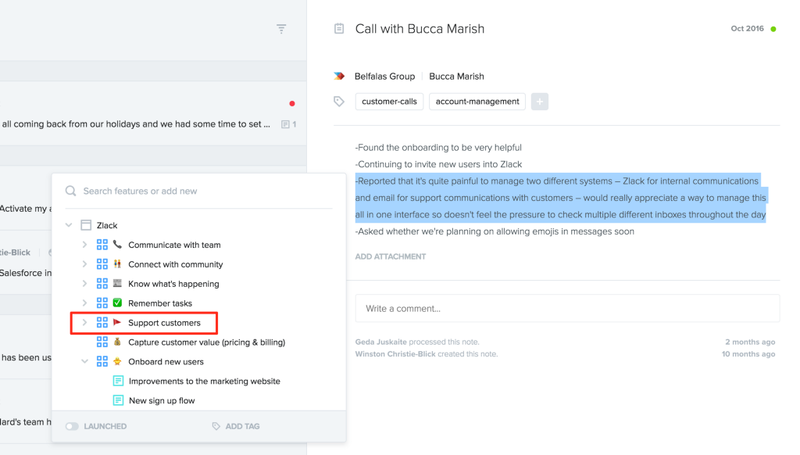 By highlighting the insight and linking it to a related user need (component) on the features board, we can keep track of it over time and see if others face the same issue. 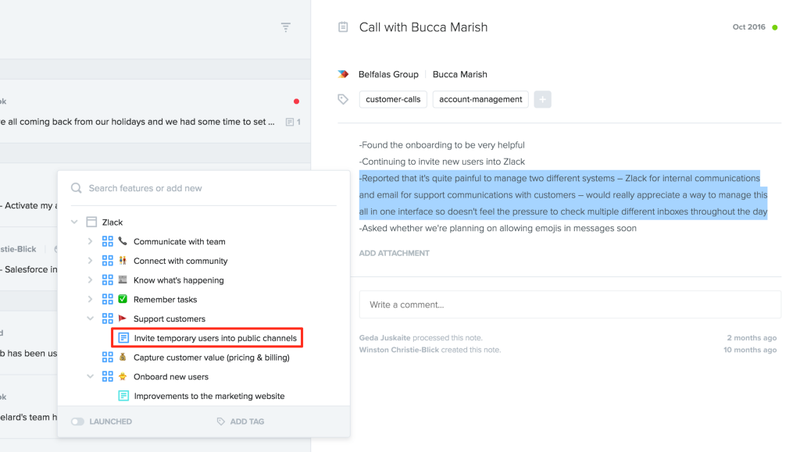 As we learn more about this need and further clarify it, we can begin linking feedback directly to relevant feature ideas — either by selecting existing features from the product outline or creating new feature ideas on the fly. User needs and feature ideas can be created on the fly while processing feedback on the Research board (see above) but you’ll have even more flexibility doing so from the Features board. As we link more and more feedback to user needs over time, we’ll begin to get a full picture of what core needs are most important to users. Earlier we saw how the user impact score allows you to quantify how many people have which needs, weighted by importance. Because the Features board aggregates user needs up the hierarchy, rolling up low-level needs into high-level ones, we can quickly zero in on those un-met needs that are most pressing for users today. 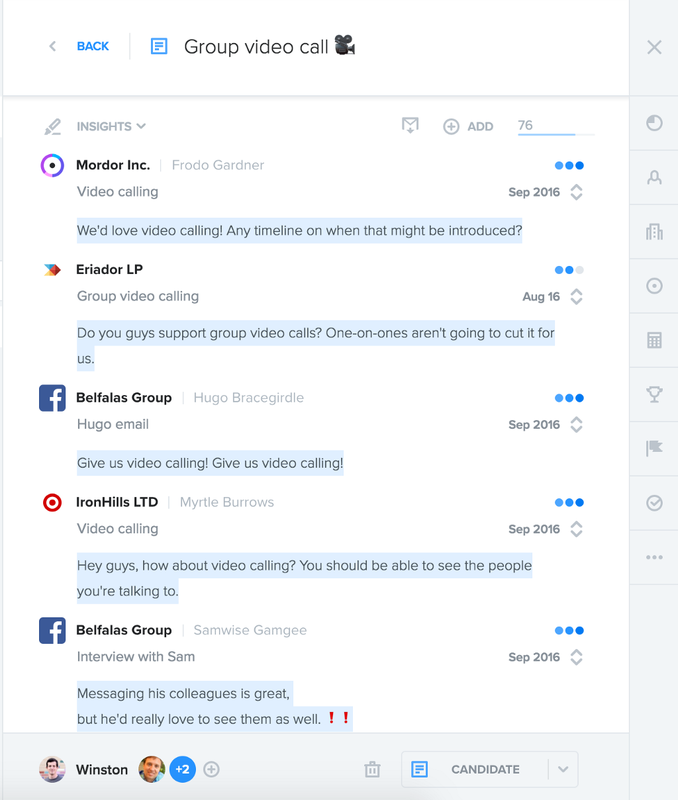 And as noted earlier, we can always select a need or a feature idea to immediately see everyone who has ever expressed that need or requested that feature, exactly what they said, and how important it is to them. Everyone who has ever asked for the group video calling feature, what they said, and how important it is to them. This provides context that helps PMs, designers, and developers ensure they understand what problem they’re solving for as they build new functionality. Designers can even conduct user interviews with these users before completing final designs or kicking off development. Doing so helps prevent wasting effort delivering highly-requested features that still go underutilized. After all, different designs for the same feature idea may solve vastly different needs. 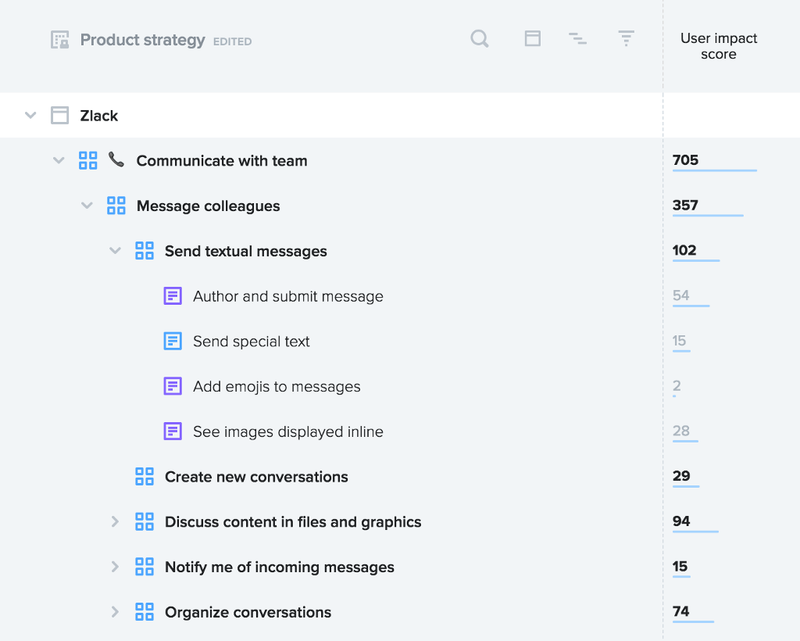 Whether logged in productboard or on sticky notes, feature ideas are best grouped by user need because doing so emphasizes that your team’s primary goal is not to ship features, it’s to address user needs. This organization doesn’t just impact the way you make key product decisions, it influences the data your team collects in the first place. After all, the way you structure information influences what information you gather. It means the next time you’re asked by the tenth customer in one week for the ability to upload files to your messaging app, you won’t just add a +1 to an “upload files” feature and move on. You’ll immediately try to envision where this request belongs in your product outline. PM: Interesting, so what kinds of files do you intend to be collaborating over with your team? User: Most all of them are mock-ups. I work closely with our designers and we collaborate over design iterations several times a week, but some members of our team would benefit from seeing these discussions without having to log into Invision. PM: You use Invision? Instead of exporting images out of Invision before uploading them into Zlack, would it be easier to push them directly to our app? User: I didn’t even think of that! Yes, I’m sure my designer would appreciate that since he often shares 10+ graphics at a time. Armed with this new information, you can revise your hierarchy and, if necessary, add any new feature ideas the conversation inspired.